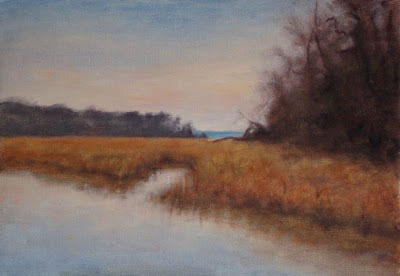 Oil on Canvas 20" x 14"
I live on the flat coastal plain, surrounded by the expanding wide mouths of rivers. This is where salt and fresh waters meet, flowing along towards the ocean. The tidal marsh and swamp are ubiquitous-all have their moments. As long as I am here, I will continue to experiment with capturing their magic.